Super Hero Sandwich - Treat Dad This Father's Day! 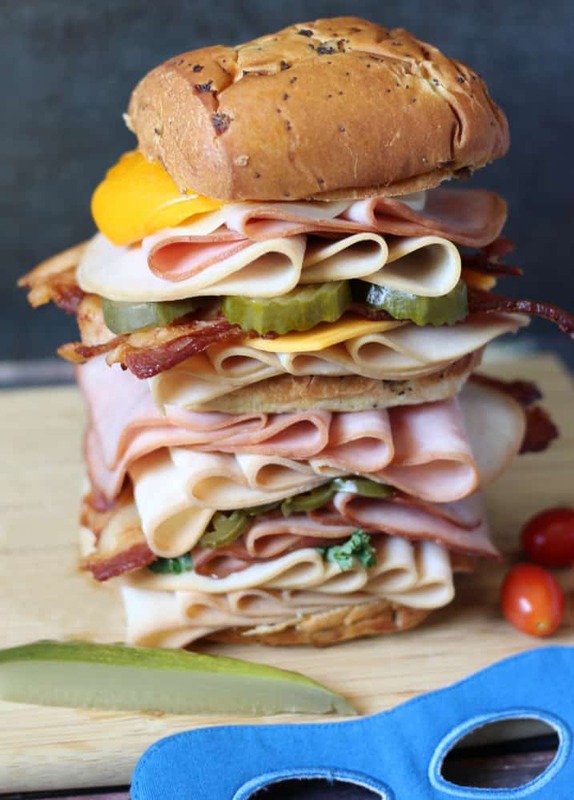 Super Hero Sandwich – Treat Dad This Father’s Day was brought to you by Smithfield. All opinions are mine. My husband, Ben, is a self proclaimed sandwich lover. I have honestly never met anyone who loves sandwiches as much as he does. He has had aspirations, in fact, to open up a sandwich shop, because he knows exactly what it takes to make *the* perfect sandwich. So, it was a bit daunting to make this super hero sandwich for him, but the end result was perfection. 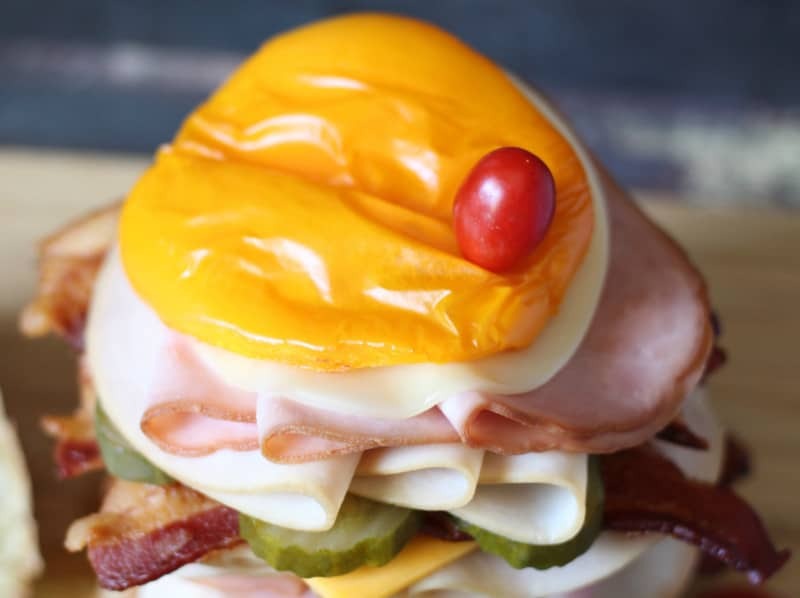 He is the super hero of our family, and he loves super hero movies, so I wanted to incorporate that thought into this sandwich. I started with a great selection of meats because well, that is the true essence of a sandwich! 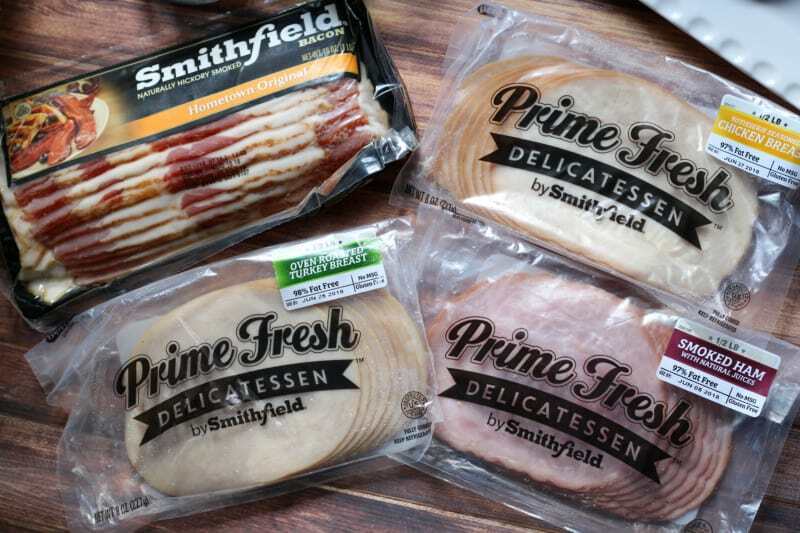 Smithfield Prime Fresh Delicatessen Rotisserie Seasoned Chicken Breast, Oven-Roasted Turkey Breast, Smoked Ham, and Hometown Original Bacon were the meats of choice for this sandwich! If you want to mix it up with Prime Fresh meats, there are many to choose from, like roast beef, honey ham, and smoked turkey breast. You can find Prime Fresh deli meats in the refrigerated meat case in your grocery store. 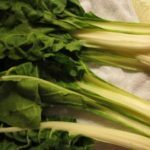 They are gluten free with no MSG, are affordable and great tasting, with deli fresh quality…without having to stand in line! I cooked the bacon in the oven on some parchment paper on 325 degrees, because I find that is the easiest for me. I then chose his favorite cheese, Provolone, and grabbed some Cheddar slices, as well. Vegetables always add color and different flavors to sandwiches. For the super hero sandwich, I chose thick cut pickle slices, jalapeño pepper slices, and a little bit of kale. I finished the top off with a grilled half of an orange bell pepper and a cherry tomato. It almost looks like a cape…which is the finishing touch and key mark of a true super hero…like Dad…and like this sandwich! A special note made of mustard makes it truly Father’s Day worthy! 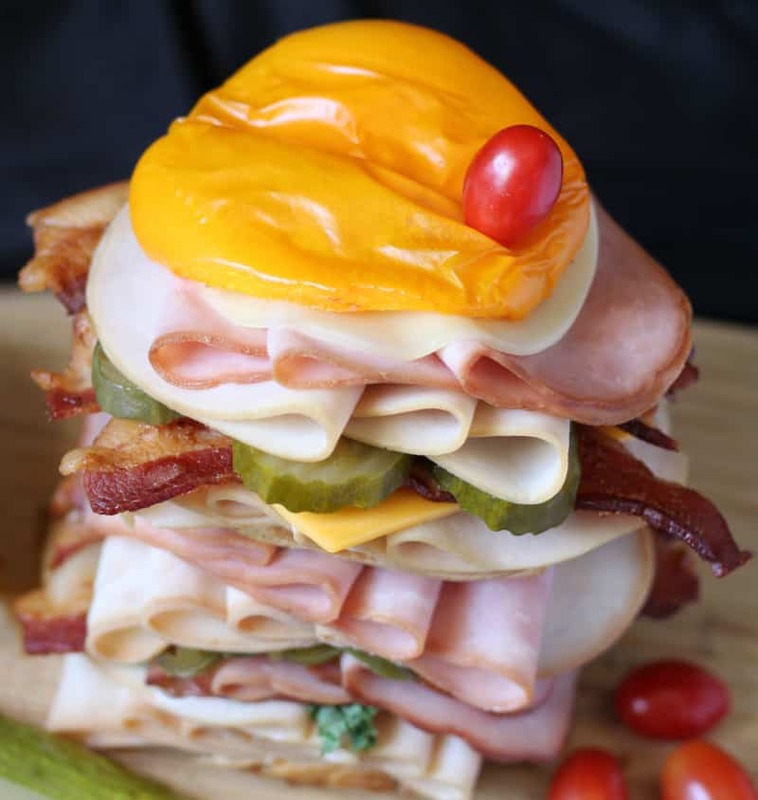 This sandwich can be toasted, grilled, or left uncooked…it is delicious any way you prepare it! I toasted the onion bread buns and cooked the bell pepper in the oven, but a totally warm sandwich would be delicious, too! appealing to young and old alike! Hubby was very impressed with his super hero sandwich! 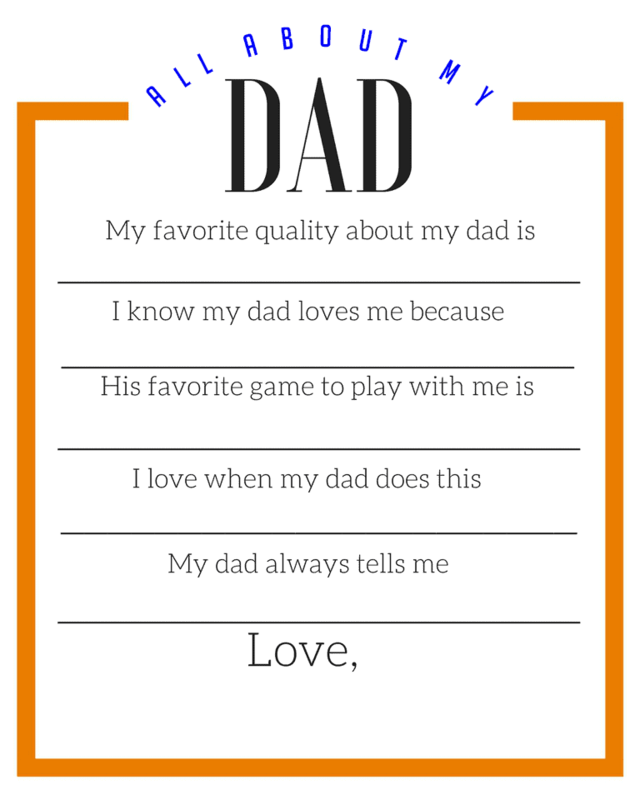 A special bonus treat alongside his super hero sandwich was a printable “All About My Dad” that the boys had filled out. It was an extra way of letting him know how special he is and how much we truly appreciate him. Print the All About My Dad printable by clicking on the image below. 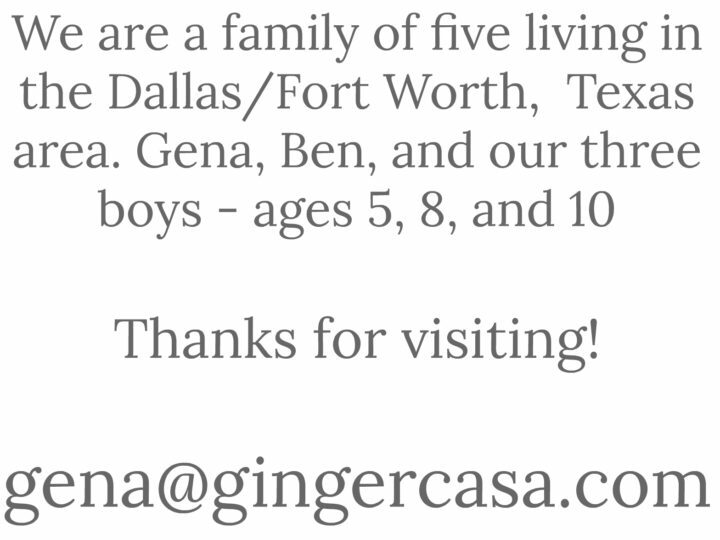 It will open up a PDF which you can print! 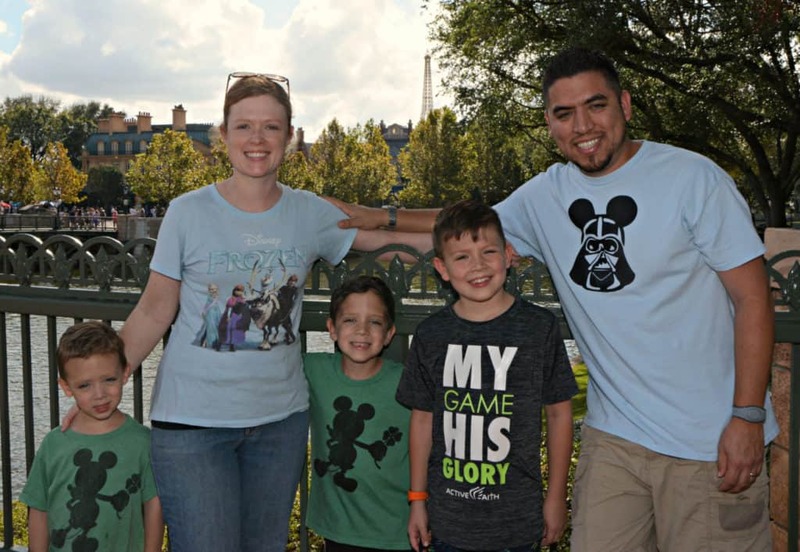 How do you plan to spoil Dad this Father’s Day? What else would you add to this super hero sandwich? Visit PrimeFreshDeli.com for more super inspiration! 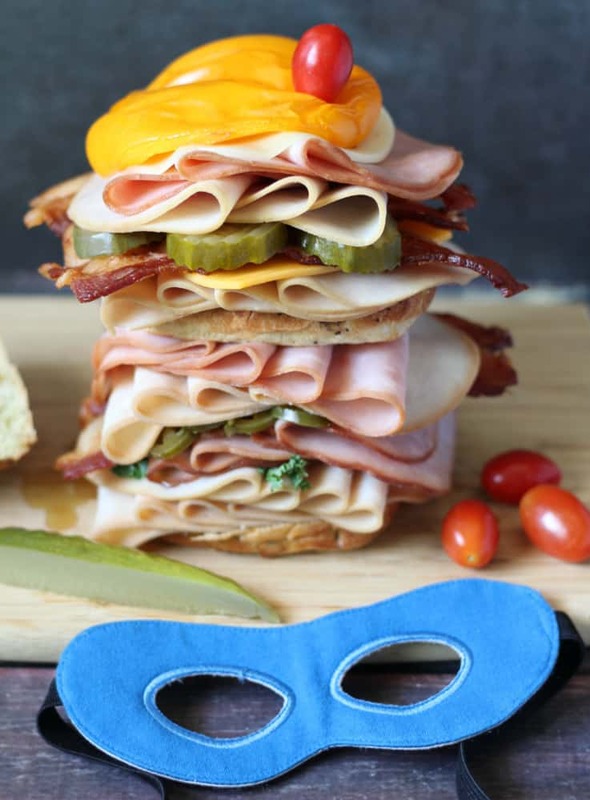 Serve up this delicious sandwich for your super hero! Toast onion bread bun in toaster or toaster oven. Start building your sandwich! Anything goes, really, just secure it with toothpicks if necessary. Alternate meats, cheeses, and veggies. Add your grilled bell pepper...the super hero cape of the sandwich! 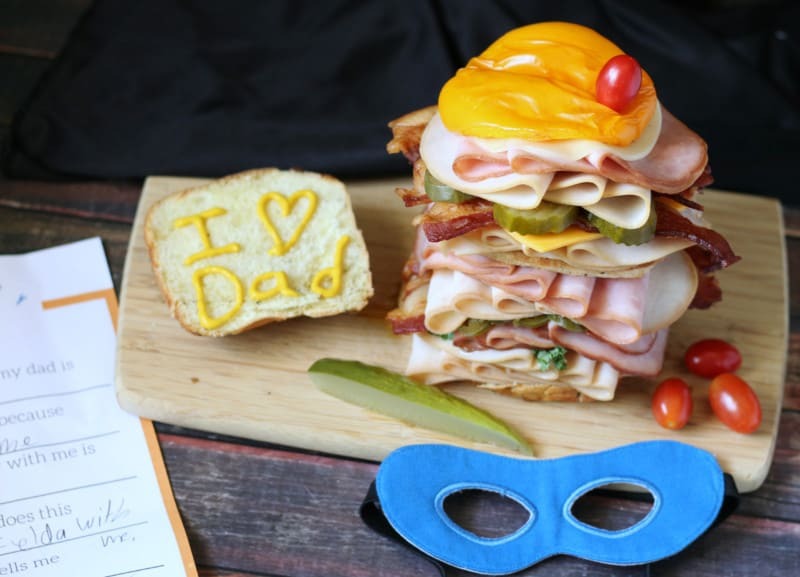 Write "I [heart] Dad" in mustard, diced onions, and/or pieces of bacon to put the finishing touches on your superhero sandwich! Serve to Dad and watch him add the bun on the sandwich and for the final step...eating and enjoying! Holy cow. That is some sandwich! It looks so good. 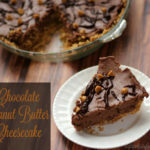 Father’s Day is a great time to show you appreciation and reach them through their tummy! We had a great Father’s Day here. Hubby chose homemade lasagna as his ‘special meal’. Father’s Day definitely has a strong food focus in my house! This is QUITE the sandwich! 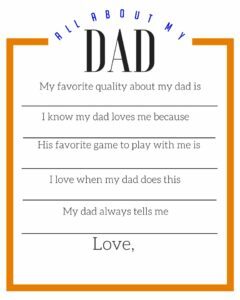 lol I love the little printable page for the kids to fill out about their dad, too. Woah! Look at that sandwich, it surely is fit for a superhero. 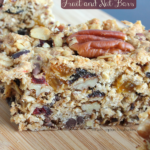 I know a few dads that would enjoy this treat, I am going to have to try to make it! That is one delicious looking sandwich! I think I’d have to steal a bite or two from my dad! And doesn’t bacon make everything better?! YES! Bacon makes everything better! !